Whether you are raising goats for meat, milk or wool, or just keeping goats for fun, you need to provide some sort of shelter where they can get a hedge against the cold and the wet. Goats are not fussy; they don't need fancy accommodations, they need sturdy ones. DIY solutions are plentiful; you can put a goat shelter together in an afternoon. Cattle or livestock panels serve as the form of a half-moon shelter. You can create such a shelter in a fixed location with T-posts or a wooden frame, allowing you portability. To erect panels with T-posts, start by placing a cattle panel flat on the ground. Position two T-posts at one of the short ends, on either side of the panel and close against it, and drive them into the ground. Move the cattle panel out of the way and position two additional T-posts, in line with the others, 6 feet away, creating a square. Lift the cattle panel and position the one short end up against the first two T-posts. Bend the panel to bring the other end up between the second two T-posts, creating a half-moon. Secure the panel to the T-posts with twine or zip ties. Cover the expanse within the half-moon frame with heavy-duty tarp for protection from precipitation, securing it with twine. For larger shelters, use additional cattle panels. Pallets are great building tools for the DIYer, and they provide a good foundation for shelter walls. Attach pallets together to create walls, then Cover the pallets with tarps or plywood to prevent wind and rain from coming in the slats. For height, stack pallets longwise, one's end atop anothers, and pound a T-post through the gap in the middle. For a roof, cover with a tarp, metal sheeting or a simple wooden roof frame, and cover with shingles. Elevate one end slightly to ensure a deluge won't collapse the cover. A pallet attached with a hinge, makes a good gate. A three-sided shed, aside from the roof, is not much different than putting up a wooden fence. Determine the size of your shelter and dig holes in the corners for wooden fence posts. Depending on the size, you may need to add additional posts. Use taller posts for the two in the front section, which will be the opening to the shelter. This will let you create a slanted roof to allow water to drain. Connect the fence posts horizontally with 2-by-4s to create the frame. Enclose the shelter with fence boards, again using longer boards at the front of the shelter, gradually decreasing in size on the sides. Attach a metal sheet roof. 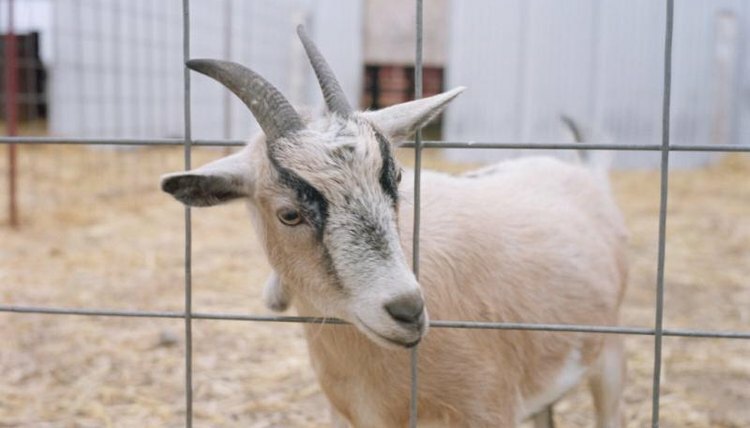 In addition to these projects, a few other options are available for goat shelters. Old doghouses provide shelter for smaller breed goats or kids. You can convert unused storage sheds into goat shelters. Another option, provide you have a way to transport it, is old metal culverts.